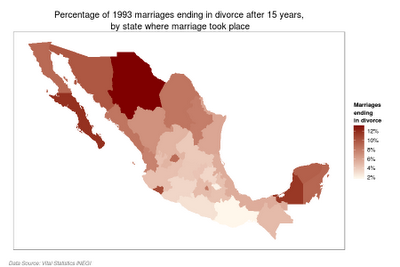 Over the last two decades families in Mexico have undergone rapid social changes. 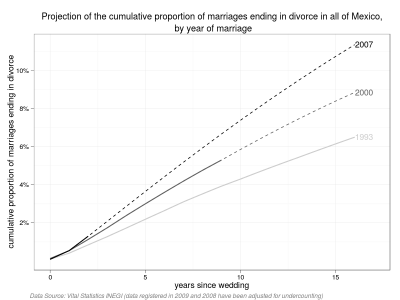 The proportion of marriages ending in divorce has risen for each cohort since data became available, this is independant of the recently approved express divorce law in the Federal District. On October 2008 Mexico’s capital, the Federal District, approved a version of no-fault divorce locally known as “express divorce”. With the new law the requesting spouse no longer had to provide a cause to dissolve the marriage and the couple no longer had to live apart before filing for divorce. Furthermore, the process of determining child custody and alimony were now separate from the divorce trial. 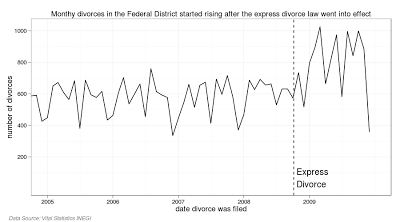 The Federal District has so far been the only federative entity in Mexico to adopt a less adversarial divorce system.